Smarter. Das Honor 9 Lite mutet mit nicht mal 230 Euro als echtes Schnäppchen an. Das SoC stammt aus der oberen Mittelklasse und auch die übrigen Spezifikationen können sich sehen lassen. Dazu gibt es zudem vier Kameras. Wie sich das Smartphone im Test gegen die Konkurrenz und das Schwestermodell Huawei P smart schlägt, lesen Sie im Test. Das Honor 9 Lite hat viel Gutes zu bieten. Es ist schick anzusehen – die schimmernde Rückseite hat es von seinem Flaggschiff-Paten, dem Honor 9, geerbt und es fehlt auf den ersten Blick an nichts. Die Schwächen werden auf den zweiten Blick erkannt und befinden sich in Ausstattungsdetails und in der Kamera. Auch der Akku kann nicht vollends überzeugen. Bei Smartphones werden Technologien immer schneller von der Oberklassen in die unteren Segmente weitergegeben. Vor wenigen Jahren galten Fingerabdruckscanner noch als etwas besonderes, das den Highend-Smartphones vorbehalten blieb, mittlerweile finden sie sich selbst bei manch günstigem Einsteigermodell. Wer sich mit einem Etat von rund 200 Euro auf die Suche nach einem neuen Smartphone macht, der sollte das Honor 9 Lite auf jeden Fall in Betracht ziehen. Für das Geld bekommt man ein gut aussehendes und gut ausgestattetes Mittelklasse-Smartphone. Ob einen die erwähnten Schwachpunkte stören, muss jeder für sich selbst entscheiden. Für den Preis von 229 Euro hat das Honor 9 Lite auf den ersten Blick ein überzeugendes Gesamtpaket zu bieten. Das Smartphone ist zwar nicht das schnellste, hat aber ein schickes Design, wird direkt mit der aktuellen Android-Version ausgeliefert und bringt zwei Dual-Kameras mit. Gegenüber einem Huawei P Smart sparen Sie mit dem Honor 9 Lite mit der völlig gleichen Ausstattung 30 Euro! Wenn Sie auf ein Metallgehäuse verzichten können und sich mit rutschigem Glas anfreunden können - uns zumindest gefällt das Honor 9 Lite mit seiner spiegelnden Glasrückseite sehr gut. Zwar verzichtet Honor auf eine Cashback-Aktion. Für den Preis von 230 Euro bietet das Honor 9 Lite ziemlich viel: gutes Display, starker Akku, zwei Kameras vorne und hinten, ein schickes Glasgehäuse sowie aktuelles Android. Gegen einen Kauf spricht kaum etwas. Der Hersteller hätte auf USB Type C und WLAN mit 5 GHz setzen können. Die vielen Apps sind zwar nervig, lassen sich jedoch deinstallieren. Für den Preis von 229 Euro hat das Honor 9 Lite auf den ersten Blick ein überzeugendes Gesamtpaket zu bieten. Das Smartphone ist zwar nicht das schnellste, hat aber ein schickes Design, wird direkt mit der aktuellen Android-Version ausgeliefert und bringt zwei Dual-Kameras mit. Auf der Schattenseite stehen der alte Micro-USB-Port, der in dieser Preisklasse aber gerade noch zu akzeptieren ist, und der schlechte Lautsprecher. 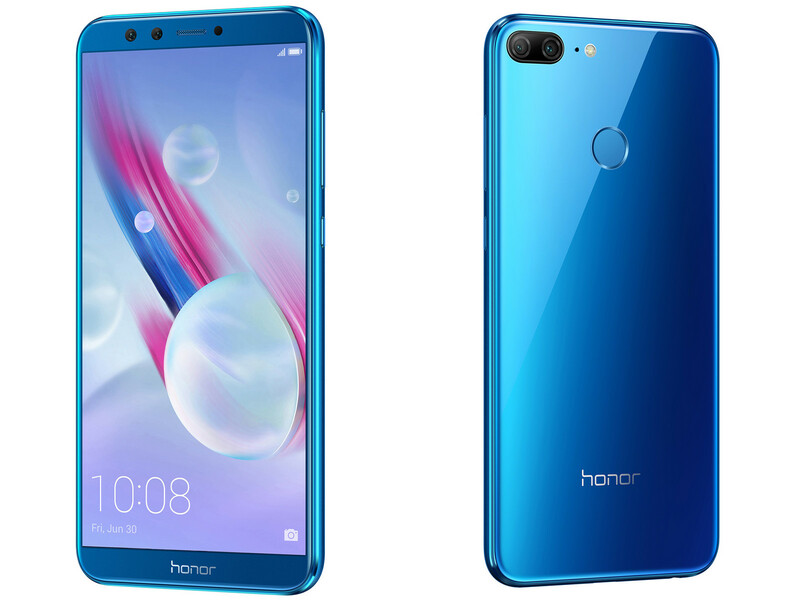 Das Honor 9 Lite ist Huaweis neuer Vorstoß in den günstigen Mittelklassebereich  und nahezu baugleich mit dem unter Huaweis eigenem Namen vertriebenen P Smart. Das 9 Lite hat ebenfalls einen 5,65 Zoll großen Full-HD-Bildschirm, 3 GByte Arbeitsspeicher und als SoC den Kirin 659. Ist das Honor 9 Lite der neue Selfie-König? Im Grunde gibt es beim Honor 9 Lite wenig Grund zur Kritik, und selbst bei der etwas enttäuschenden Kamera muss man relativieren und die Bildqualität vor dem Hintergrund des niedrigen Preises sehen. Ein Smartphone, das 230 Euro kostet, kann eben keine sehr gute Kamera haben, denn die würde den Preis unweigerlich in die Höhe treiben. Ein großes Display im kompakten Format, gute Kameras auf beiden Seiten, das neueste Android und ein umfangreicher Lieferumfang: Das Honor 9 Lite hat für einen Preis von knapp 230 Euro so einiges zu bieten, ohne dass ihr dafür nennenswerte Abstriche machen müsst. Daher gibt es eine klare Kaufempfehlung. The Honor 9 Lite might not have all the mod cons but it's one of the cheapest phones around to offer an 18:9 screen with a bezel-free design. It's an attractive phone and general specs are good, including no less than four cameras. It doesn't have flawless performance but there's little to complain about at under £200 making it one of the best budget phone around. The Honor 9 Lite might not have all the mod cons but it's one of the cheapest phones around to offer an 18:9 screen with a bezel-free design. The Honor 9 Lite is the phone for those who are looking for something stylish and premium yet doesn’t cost much. It’s not a lightweight in terms of performance as it is good and responsive and can handle graphic-intensive games. Camera quality is okay but don’t expect a lot when shooting in low-light. If you want something that is premium and almost in the same league as the Huawei Nova 2i but for a lower price of Php9,999, this is the one to get. It might not have hit readers yet, but the Honor 9 Lite is extremely competitive considering its price in other regions. In fact, its Php Php 7,990 pricing is lower than the initial China sticker price of RMB 1,199 (around Php 9.9K) that the phone debuted for in China. For a phone that is priced at RM749, there isn't a lot of competition but at the same time, this is a phone for a user who doesn't need a lot of requirements. It looks nice and the camera is quite good, so that's all an average user really needs. While the battery is a bit of a letdown, iy is not that much of a problem when it's not pushed to the limits. The Honor 9 Lite might not have all the mod cons but it's one of the cheapest phones around to offer an 18:9 screen with a bezel-free design. It's an attractive phone and general specs are good, including no less than four cameras. It doesn't have flawless performance but there's little to complain about at under £200 making it the best budget phone around. The Honor 9 Lite’s bezel-light design and twin-lens camera tricks are eye catching, but it’s perhaps too quirky to fully take on the Motorola G-series at the top of the table. There’s just one little problem. The Honor 9 Lite’s graphics chip isn't powerful enough to make high-end games quite as fast as some other £200 phones. The Moto G5 Plus has the edge here, and takes slightly better photos too, but can’t match Honor for looks. 90% Honor 9 Lite Review: Another brilliant budget blower? The Honor 9 Lite is a solid budget smartphone, offering full functionality for media lovers who want a big-screen experience on the move. Of course, there’s not much to differentiate it from other recent affordable Honor and Huawei smartphones. That dual lens selfie camera doesn’t offer much of an upgrade over a single lens experience, while the phone itself is almost identical to the Honor V10, Honor 7X and Huawei P Smart in many respects. The 5.65-inch Honor 9 Lite is a nicely designed handset with an attractive 18:9 screen that performs well. But it isn't perfect: Honor talks up the two dual-lens cameras, but in fact there are low light issues and the secondary 2-megapixel cameras have limited functionality. Water resistance and fast-charging support are also absent from the feature list. It’s tough to determine how the Honor 9 Lite will fare in the real world. We had only an hour to play around with the unit at the launch event in London, but it’s looking like a budget offering that could well be worth your hard-earned cash. The Honor 9 Lite might not have all the mod cons but it's one of the cheapest phones around to offer an 18:9 screen with a bezel-free design. It's an attractive phone and general specs are good, including no less than four cameras. At under £200 this could be the new best budget phone so come back for a full review soon. Honor 9 Lite initial review: The best phone for under £200? The Lite is more than a step beyond what its name suggests. This is an affordable and entirely capable phone, wrapped in an eye-catching design that further cements Honor's increasing presence as a major player. Honor has managed to keep the spirit of the Honor 9, add new, in-demand features, and somehow drop the price too. The 9 Lite is shaping up to be a proper bargain, even if we did manage to spot a few negatives in the short time we spent with one at the launch. For the price of ₹10,999, Honor 9 Lite has plenty of things to offer – glass design, large display, quad cameras (dual rear and dual selfie cameras), and Android Oreo out-of-the-box. It’s impressive 18:9 display turns out to the crispier with the full HD+ resolution. It’s slim, lightweight, and the glass at the back feels rich. The battery lasts longer than you think. Honor 9 Lite has all that it got, there isn’t any better consideration when it comes to overall value, it satisfies the needs within the price bracket. The Honor 9 Lite is advised if you are looking for more features in affordable segment. 81% Honor 9 Lite Review- An Excellent Package! Overall, the Honor 9 Lite is one of the best phones under Rs. 11,000 currently in the market. It has all the features one would expect in a mid-range smartphone and it works well too. At a starting price of Rs. 10,999, the Honor 9 Lite has a gorgeous design, Quad-camera setup, and a good performance, which makes it a compelling device at this price range. Wish it had fast charging and dedicated SIM slots as well. Huawei certainly has a winner on its hands with the Honor 9 Lite. Yes, there are some shortcomings such as poor camera performance in low-lit conditions, app optimisations among others, but show me a phone that does not have any flaws. The starting price of Rs 10,999 (for the 3 GB RAM and 32 GB storage) for a handset that looks this lovely is itself enough for a lot of consumers to pick up this phone. It will certainly give some tough competition to its own sibling, the Honor 7X. The Honor 9 Lite is a impressive handset, not just the look but the price is just too good. Excellent handset in all departments, just that the battery performance is just about average, with about a day of battery life – depending on your usage. Honor 9 Lite is a good buy if you want a stylish phone that offers a decent overall performance and a good camera. However, battery is a crucial factor for me when it comes to narrowing down on a phone. While Honor 9 Lite seems like a good deal at Rs 10,999, remember this price is for the 3GB RAM variant and you only get 32GB space, which is low when compared to devices in this price-bracket. You can also look at options like Xiaomi Redmi Note 4, M1 A1, or Moto G5s Plus. The Honor 9 Lite is an affordable mid-range smartphone that covers all the bases – stunning design, latest Android, front and rear dual cameras, and an 18:9 display. That alone makes it a well-rounded package and the fact it fares well across the board only makes it a compelling 2018 smartphone. We’ll, of course, know more when we take it for a comprehensive spin for a detailed review. The base variant of the Honor 9 Lite is one of the better options currently in the market, with a reasonable starting price of Rs. 11,000, and an 18:9 display. If you're interested, you should note that the 9 Lite overlaps with Honor’s existing offering, the 7X, which lacks the extra cameras but does have a metal body, a larger screen, and a slightly bigger battery. As the year drew to a close, a British anthology series premiered another season of exploring and contemplating the many facets of technology and how they impact our lives. I was reeling off a binge-watch of the season when the Honor 9 Lite dropped (cautiously) in my hands. The name of the series, Black Mirror, essentially means, “the reflection of an unlit computer screen”, and when I noticed the all-glass design of the phone, the whole essence of the phrase became more apparent. Honor’s latest offering is all-glass-everywhere, perfected in a way that when the tall screen turned off, I was left rethinking my life as I saw myself. The Honor 9 Lite comes in three colors, Midnight Black, Sapphire Blue, and Glacier Grey. It will be available exclusively on Flipkart and Honor Online Store starting from 21st January. We will be reviewing the rest of the stuff in the coming days. Stay tuned. To conclude, the Honor 9 Lite is high on style quotient and the glass body surely adds premium design to the device. The hardware specifications are similar to Honor 7X and Honor 9i and the four cameras surely looks promising. Positive: Good price; attractive design; nice display; decent cameras. Negative: Slow charging. Positive: Powerful hardware; nice display; good cameras; nice connectivity; low price. 78% Recensione Honor 9 Lite: Best buy? Positive: Beautiful design; nice cameras; good price. Negative: Short battery life; no USB-C. Positive: Compact size; light weight; good price; decent hardware; impressive design; nice cameras; decent display. Positive: Low price; beautiful design; metal case; impressive dual cameras. Positive: Beautiful design; long battery life; nice display; good hardware. Positive: Good price; elegant design; decent dual cameras. Negative: Mediocre speakers. 80% Test Honor 9 Lite, Un Smartphone D'Entrée De Gamme Avec Pas Mal D'Atouts : Fiche Technique, Prix Et Date De Sortie. Positive: Good price; beautiful design; nice dual cameras. Negative: Mediocre speakers; poor connectivity. Positive: Compact size; light weight; good price; high performance. Positive: Great built quality; beautiful design; nice display; good fingerprint sensor; excellent dual cameras. Negative: Combined slot; low gaming performance. Positive: Attractive design; large screen; good hardware. Negative: No USB-C.
Обзор смартфона Honor 9 Lite: середнячок без лишнего "сахара"
Positive: Elegant design; nice display; decent cameras; support NFC; good price. Negative: Average performance; low autonomy; poor connectivity. Positive: Nice design; decent cameras; good display. Positive: Excellent cameras; nice display; metal case; good price. Positive: Impressive cameras; nice display; fast fingerprint sensor. Negative: Combined slot; no NFC chip. Positive: Metal case; good speakers; beautiful design. Positive: Good price / performance ratio; elegant design; nice display; good dual cameras. Negative: Slow charging; weak hardware. Positive: Nice design; excellent display; fast fingerprint sensor. Negative: Only microUSB; average speakers; slow system. 82% Đánh giá Honor 9 Lite: "Flagship" giá hời nhất đây rồi! Positive: Impressive display; high performance; fast fingerprint sensor; excellent cameras. Negative: No quick charging; no NFC; poor connectivity; short battery life. Modell: Als Pionier der Dual-Kamera-Technologie hat Huawei Honor die Grenzen für Kreatives erweitert und bietet beim neuesten Honor 9 Lite sowohl an der Vorder- als auch an der Rückseite Dual-Kamera-Lösungen. Außerdem sorgt ein FullView-FHD+-Bildschirm dafür, dass User ihre Aufnahmen in voller Pracht sehen können. FullView-Display bezeichnet meist ein Gerät mit höherem Bildschirm-zu-Gehäuse-Verhältnis. Das Honor 9 Lite erhielt eine 18:9-Full-HD+-Bildschirm ohne physische Tasten an der Vorderseite, wodurch es zu einem Smartphone mit FullView-Display wird. In Kombination mit geschrumpftem Rahmen ergibt sich ein Bildschirm-zu-Gehäuse-Verhältnis von 75,5 %. Mit einem 5,65-Zoll-Bildschirm ist das Honor 9 Lite weder zu groß noch zu klein. Dieses Phone liefert einen großzügigen Bildschirm und bleibt auch für kleinere Hände handhabbar. Der Rahmen ist leicht geschwungen und fühlt sich solide an. Ebenso sind die Ecken des Phones abgerundet, sodass es angenehm in der Hand liegt. Für seinen Preis reicht die Qualität. Das Smartphone ist mit 149 g ziemlich leicht. Die Rückseite aus Glas ist jedoch das größte Werbegeschenk für ein ziemlich preisgünstiges Smartphone. Allerdings ist diese ein absoluter Fingerabdruckmagnet. Daher sieht sie gleich schmutzig aus, sobald am anfängt das Phone zu nutzen. Das Honor 9 Lite ist kein Flagship-Phone. Es bietet 32 GB Speicher, während heutige Top-Modelle mit 64 GB oder 128 GB aufwarten. Allerdings können User via MicroSD-Slot Speicher hinzufügen. Die Kamera bietet eine Bildstabilisierung. Das Phone wird durch ein Kirin 659 Chipset der Mittelklasse kombiniert mit 3 GB RAM angetrieben. Am Papier scheint allerdings viel für das Smartphone zu sprechen, etwa der 18:9-Full-HD+-Bildschirm, ein Aluminium-Rahmen, eine Glas-Rückseite und Android 8. Honor hat es geschafft dem Honor 9 und Honor 7X zu folgen und das Honor 9 Lite mit einem Dual-Kamera-Setup auszustatten. Sowohl die Kamera an der Vorderseite als auch jene an der Rückseite beherbergen je einen 13-MP- und einen 2-MP-Sensor. Wie beim Honor 7X ist der kleinere sekundäre Sensor nur dazu gedacht, Tiefeninformation für die Wide-Aperture- und Portrait-Modi zu liefern. Im Wide-Aperture-Modus kann der User die Stärke des Effekts in der Bearbeitungsphase von einer Blendeneinstellung von f/16 (minimale Unschärfe des Hintergrunds) bis zu f/0.95 (sehr unscharfer Hintergrund) einstellen. Das Honor 9 Lite verfügt über einen 3.000-mAh-Akku, was für ein Phone dieser Größe typisch ist. Honor behauptet, dass der Akku bei allgemeiner Verwendung einen ganzen Tag lang durchhält. In puncto Laden geht Honor 9 Lite einen ziemlich minimalistischen Weg. Weder gibt es weder USB-C- noch Wireless-Charging, obwohl das Phone eine Glas-Rückseite hat. Das Honor 9 Lite ist ein großartiges Gerät der unteren Mittelklasse, doch das Xiaomi Redmi Note 5 ist ein starker Konkurrent. 5.65": Der Display ist relativ groß für Smartphones. Diese Display-Größe wird für Smartphones sehr häufig verwendet. Große Bildschirmgrößen ermöglichen höhere Auflösungen und/oder man Details besser erkennen (zB größere Schrift). Kleinere Display-Diagonalen dagegen verbrauchen weniger Energie, sind oft billiger und ermöglichen handlichere, leichtere Geräte.» Prüfen Sie in unserer DPI Liste, welche Displays wie fein aufgelöst sind. 81.07%: Diese Bewertung muss man eigentlich als durchschnittlich ansehen, denn es gibt etwa ebenso viele Notebooks mit besseren Beurteilungen wie Schlechteren. Die Verbalbeurteilungen klingen aber oft besser als sie wirklich sind, denn richtig gelästert wird über Notebooks eher selten. Obwohl dieser Bereich offiziell meist einem "Befriedigend" entspricht, passt oft eher "mäßiger Durchschnitt".